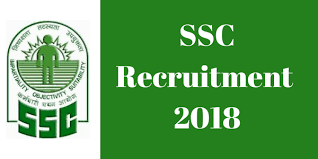 Applicants of Constable (GD) in CAPFs, NIA, SSF and Rifleman (GD) in Assam Rifles Examination, 2018 may please note that the process of submitting applications for the said recruitment examination consists of the following two parts: (i) One-Time Registration (ii) Filling of online Application Form The Commission had provided both these facilities on its new website w.e.f. 25.07.2018, but because of a very heavy load of applications, the new website of the Commission had become very slow, for which reason, it was temporarily withdrawn by the Commission. However, while withdrawing these facilities, the Commission had informed all candidates that both the facilities i.e. One-Time Registration and filling of online Application Forms would be resumed on the Commission’s website w.e.f. 17.08.2018 at 10 AM and the last date for receipt of applications would be 17.09.2018 at 5 PM. This position is maintained by the Commission. In the meantime, the Commission has for the convenience of the candidates resumed the facility of One-Time Registration, on its website i.e. www.ssc.nic.in w.e.f. 14.08.2018, wherein candidates can start registering themselves as per procedure given vide Notice dated 22.07.2018. However, as indicated above, the facility for submission of online applications would only re-commence from 17.08.2018 at 10 AM. Any applicant, who wishes to apply for the said examination may register themselves on the website of the Commission w.e.f. 14.08.2018 and submit online application after 17.08.2018. It is reiterated that last date for submission of online applications would be 17.09.2018 (5 PM). As the new website of the Commission may take some time to stabilize, for initial few days, to minimise the inconvenience to candidates, applicants are advised to also utilize off-time or non-peak hours of 10 PM to 8 AM for making One-Time Registration and filling of online Application Forms.